The Schick Intuition Pure Nourishment features Coconut Milk and Almond Oil infused in the skin conditioning solid to help moisturise dry skin during shaving and has a new Lavender handle. Each package contains two refill cartridges, a shower hanger and a convenient travel cap.... The Schick Intuition Pure Nourishment Razor formulated with coconut milk and almond oil moisturizes and helps soften skin during shaving. It also features a 4-blade pivoting head to glide smoothly along the contours of your legs and body. About the new Schick� Intuition� Pure Nourishment� razor Coconut milk and almond oil have long been lauded for their skin-benefiting qualities. 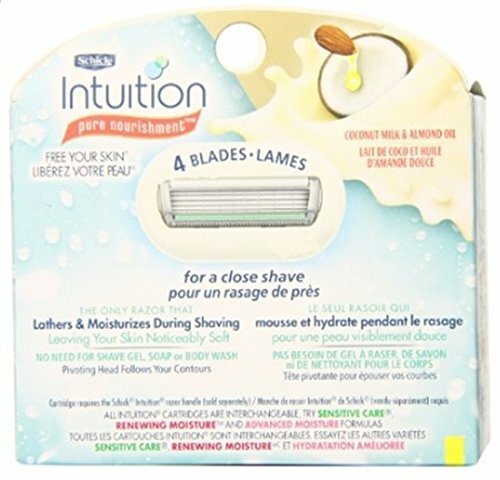 Now, you can enjoy the power of these ingredients with the new Schick� Intuition� Pure Nourishment� razor.... Schick Intuition Pure Nourishment refills are infused with coconut milk and almond oil. The formula lathers and moisturizes during shaving, so theres no need to use shave gel. It simplifies your shave and cares for your skin. Schick Intuition Pure Nourishment Refills with coconut milk and almond oil to moisturise and help soften skin during shaving. The refills also feature a 4-blade pivoting head to glide smoothly along the contours of your legs and body. 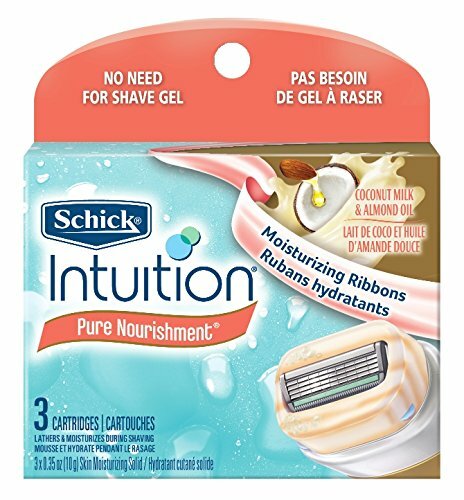 Schick Intuition Pure Nourishment is a razor that shaves, lathers and moisturises all in one. A skin conditioning solid creates its own light lather when wet to offer an incredibly close shave with no need for soap, shave gel or body wash.